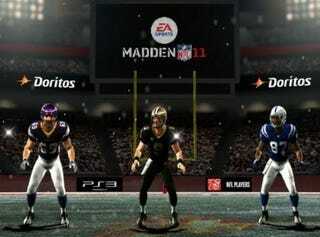 A Doritos/EA Sports promo is giving fans the vote on who makes this year's Madden cover. The candidates are Minnesota defensive end Jared Allen, New Orleans quarterback Drew Brees, and Indianapolis wide receiver Reggie Wayne. Of the three, Brees - a Super Bowl quarterback - could be considered the front-runner. Allen's candidacy is remarkable, and admirable. No lineman of any type has made the main Madden cover, and just two defensive players have: Baltimore linebacker Ray Lewis for Madden 2005, and Pittsburgh safety Troy Polamalu, who shared it with Arizona wide receiver Larry Fitzgerald for Madden 10. Fitzgerald is also the only receiver to make the cover. And oh, LOL regarding this: During the voting window, Madden cover alums Shaun Alexander, Eddie George and Marshall Faulk will appear on Doritos bags "to help inspire people to get out there and vote." All three were among worst victims of the Madden Curse. I wonder what tragedy will befall them now for appearing on a snack food bag. You want my endorsement? Jared Allen, just to be different. But I'm sure if the Saints win the Super Bowl, Brees will win in a landslide. He might beat out Wayne even if the Colts win. You may vote at the link below.